12'&14' Wide Round Style Greenhouses, UP TO 32' Long! These Greenhouses are ideal for the backyard hobbyist or the professional grower offering you more valuable growing space. Purchase the greenhouse alone, or save hundreds of dollars and purchase the entire Greenhouse System. There is no guess work involved here. We've done all the calculations for you. You get exactly the equipment you need for your size greenhouse, and the entire system is shipped directly to your door. Frame is manufactured from highest quality Allied Gatorshield structural steel tubing, with 4' rafter spacing. End frame is constructed from strong 16 gauge, 2" square Allied Gatorshield structural steel tubing. Ends are covered with 8mm twin-wall polycarbonate that offers superior insulating and reduced heating costs, and comes with a 10 year warranty. Heavy duty ground posts are included. We do recommend using a baseboard. Our recycled plastic lumber is ideal. Top covering is our double layer, 6 mil 4 year greenhouse film, with Inflation Fan Kit, that allows for superior heat retention. Poly latches are included. "Twist-of-the-wrist" roll-up sides make ventilation easy. Units come equipped with a 36"W x 80"H heavy duty, aluminum man door, complete with 6mm polycarbonate sections at both top and bottom, stainless steel hinges and latch. Optional Second Door Kit, sold separately. During extreme heat, use our SunBlocker 60% black knitted shade panels, sold separately, to eliminate heat stress and to ensure optimum plant growth. • Pro-Com Blue Flame Heater in your choice of natural gas or propane. • Control Blower for Blue Flame Heater. • ValuTek™ Direct Drive Exhaust Fan with shutters. • ValuTek™ Heavy-duty, Motorized Aluminum Intake Shutters. • ValuTek™ Hanging Air Circulation Fan. 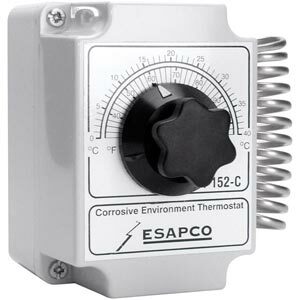 • Durostat™ NEMA 4 Dual Voltage, Waterproof Thermostat. 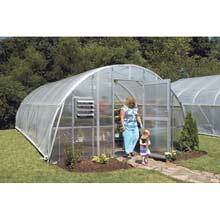 • Please note that size and quantity of items are determined by the size of your greenhouse. spread warm air. * Heater cannot be sold in California and is not for use at altitudes above 5,5000 feet.